Raw foods can be so refreshing this time of year and adding them to your meals adds a whole list of health benefits including improved digestion. Foods that are raw come with enzymes which help to get the whole digestion thing started. That means your body doesn’t have to work as hard to break the food down all on its own. And you know what that means? More energy for you! Healthnuttiness aside, what I love about this is you can make the slaw salad ahead of time (it’s actually even better the next day) and, if you plan it right, have dinner and lunch (or lunches) covered. Cook once, eat twice! 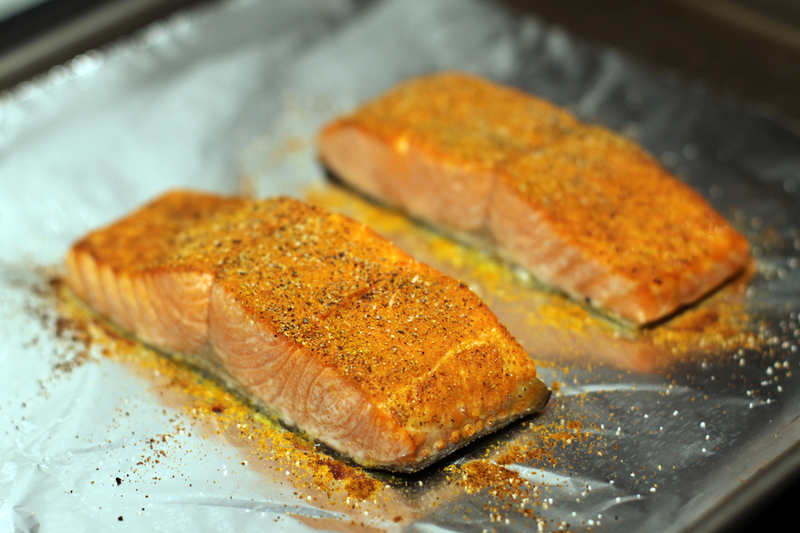 As for the salmon, it doesn’t get any easier than sprinkling on a little curry powder and sticking it under the broiler. I said this is my new favorite meal for spring for a reason… no cooking. no clean up. no reason not to be outside playing! 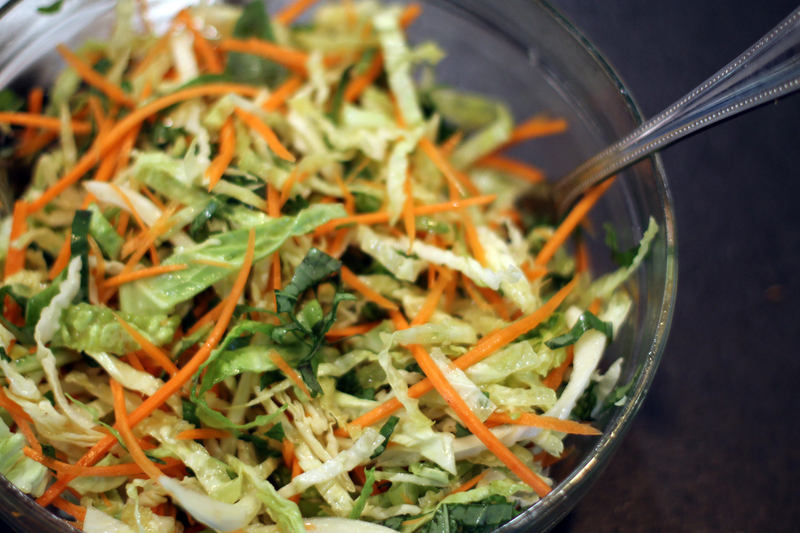 In a large bowl, combine cabbage, carrots, basil, then toss with lime juice and olive oil. Add salt and pepper to taste. To start the salmon, heat the broiler. Place filets on a foil-lined baking sheet skin side down and dust the tops of the fish with curry powder to just cover the filets and sprinke with salt and pepper. Broil salmon 6-8 minutes. 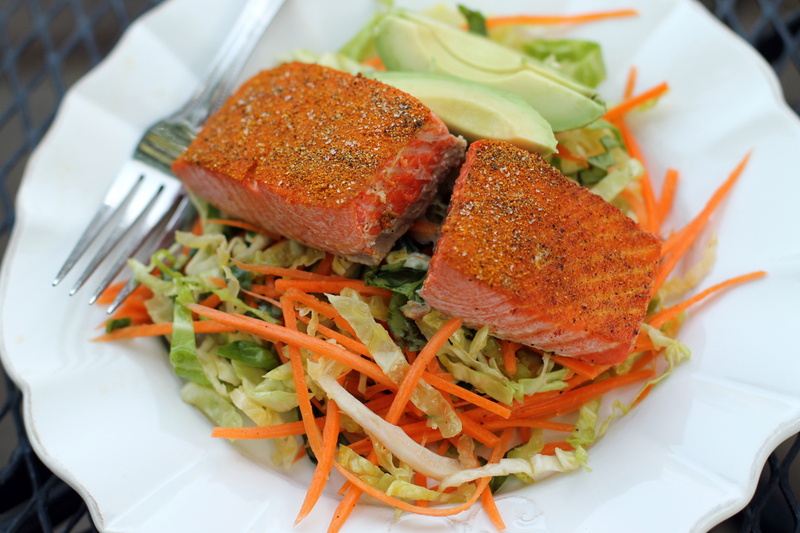 Serve slaw topped with salmon and enjoy! Simple and elegant, Dinner’s ready.Sure to be a winner in my home.